Photographers Shona Curtis, David Blackett and Alegre Poniros were among those juried into IMAGES 2012, 31st Annual Photography Exhibition, Shoreline Arts Alliance at Guilford Art Center, 411 Church St, Guilford, CT. The exhibit runs from April 1 - April 21, 2012. There was an opening reception and awards ceremony on Saturday, March 31, 2012. Congratulations to Shona Curtis who won a First Honors portfolio award for her three intimate black and white images of her father. Other First Honors recipients are: Miela Barocas Mayer - Guilford, David Gillich - Milford, Dianne Thouin - Old Saybrook. Honorable Mention Recipients are: Sara Augenbraun - Wilton, Liz Calvi - West Hartford, Peter Cooperman - Avon, Kathryn Frederick - Killingworth, Jill Grossman - Chester, Jerry Reed - Essex, Dana Osborn - Middlebury and David Ottenstein-New Haven. The Ann Christensen Award winner is Jackie Heithchue-Madison. IMAGES 2012 was juried by Jill Enfield, Lance Keimig and John Stanley. The complete list of selected photographers is available here in a pdf. At the close of the show some of the images will be reinstalled at CT Hospice in Branford. Client Laurie Lambrecht was written up in the New York Times on June 19, 2011 for her exhibit of photographs "In Roy Lichtenstein's Studio 1990-1992" at the Drawing Room in East Hampton, NY. The show came down June 27, 2011, but I wanted to give a mention of her presence in the Gray Lady. I have previously written about her here and here. 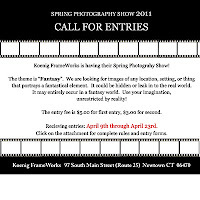 Koenig FrameWorks and Gallery in Newtown, CT is hosting a winter photography show and competition titled "Scapes", with the theme of landscapes, cityscapes, and seascapes. 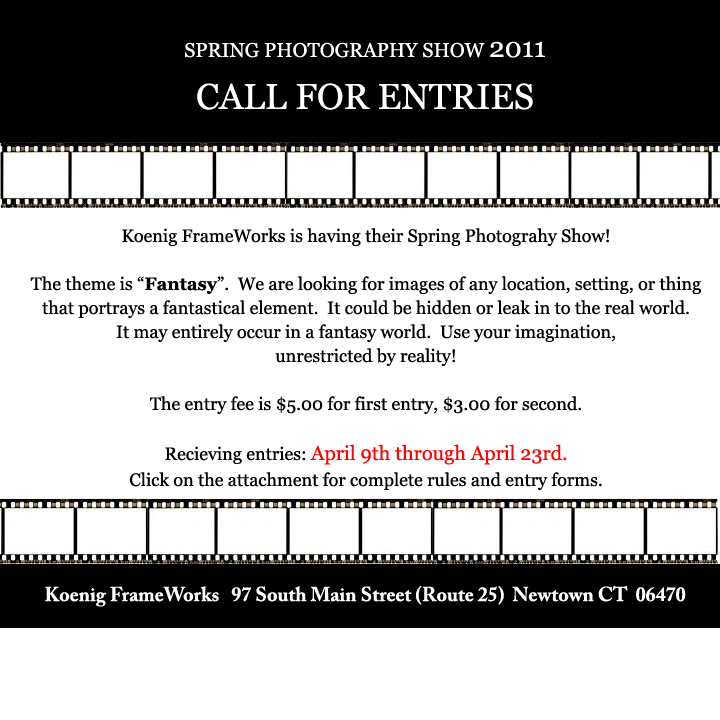 Submissions (matted, but not framed), up to two entries per person, must be delivered to Koenig FrameWorks no later than Saturday, November 20, by 5:00 pm at 97 South Main St., Newtown, CT. Entry form with full requirements here. The opening reception will be Friday, December 3, from 6-9 pm. It should be a fun night to start off December, so come out even if you are not entering. The show will remain up until December 24. For the sake of full disclosure, Mark Savoia and I are judging the competition, however we will not see the names of any entrants, and will be as neutral as possible.